We are so lucky. More than a hundred of our amazing supporters and neighbors came together on Wednesday night for the Holiday Bike Drive Sneak Peek – our annual winter fundraiser. The rooms of our bike shop quickly filled with smiling supporters who caught up with old friends and made new ones. We enjoyed fantastic food donated by Madison’s Grill and drinks poured by vivacious volunteers. James played sweet tunes from the grotto. 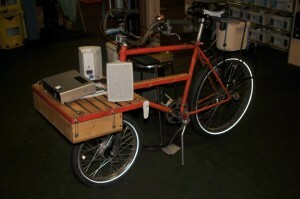 We projected Holiday Bike Drive photos and Alicia and Diego’s short film, using Gram’s rolling sound system. 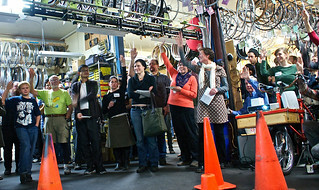 Staff and volunteers shared stories about Holiday Bike Drive and our other community programs and attendees raised their hands high to make donations to support our work like never before. Pretty much everyone pitched in to make the Sneak Peek warm, inviting, and ridiculously fun. All told, we raised $11,114 to support our work. Thanks to everyone who came, who shared stories, who raised their hands to give, who brought their friends. We are deeply grateful for our incredible and generous community. If you couldn’t make it out to the Sneak Peek but would still like to make a gift, you can do that quickly and easily online. We still have $88,296 to raise by December 31st! We would like to thank the Raymond Family Foundation for matching the first $2,500 in gifts made at the Sneak Peek. For more great photos, check out the Flickr slide show below. Thanks to our talented volunteer photographer, Shannon McWeeney, for sharing these with us!